In an interesting study, researchers from Duke University found that learning and remembering compete when both are made to occur at the same time. Test subjects were asked to learn new scenes that were presented visually as they were remember what words they had read on a screen. When remembering and studying visual scenes happened at the same time, learning was inhibited. 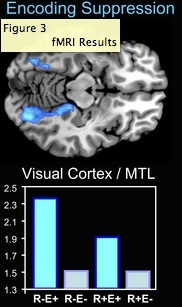 On fMRI, the decreased learning performance was associated with decreased blood flow in the visual cortex and medial temporal lobes. It would be interesting to see this sort of test in younger children (these test subjects were in their 20's) especially those with decreased working memories. We've noticed that often when multisensory teaching is recommended, students who have trouble with this form of instruction do better if the modes of instruction (seeing, saying for instance) are presented sequentially rather than at the same time...another bottleneck. Maybe students would fare better if a slight delay were given between asking questions and teaching new information. Or perhaps new information should be presented before questions were asked? We look forward to seeing more research from this group. executives in Speed Reading101 at Columbia University we separate learning a new eye-movement exercise, and comprehension. Students ask why they have NO comprehension when learning to read three-words at a time.